Your arm on Mars has unusual powers. For one thing it is nearly 2 meters long, has a scoop and grapple built into its hand, and has a camera built into its forearm. For another, it will soon deploy your ear — a sensitive seismometer that will listen for distant rumblings — onto the surface of Mars. Your SEISmomet-ear is the orange box in the foreground, while the gray dome behind it will be its protective cover. 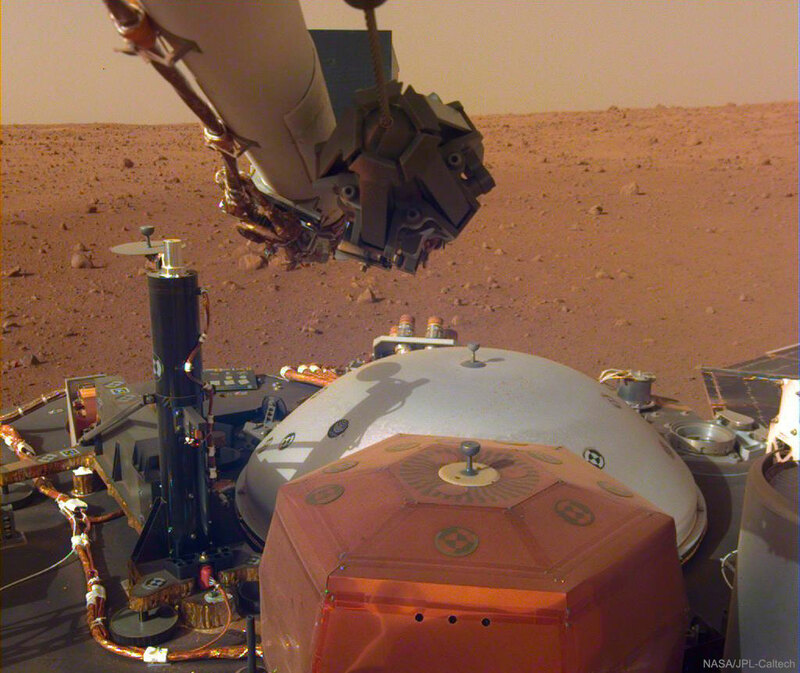 Your arm is attached to the InSight robotic lander that touched down on Mars two weeks ago. Somewhat unexpectedly, your ear has already heard something — slight vibrations caused by the Martian wind flowing over the solar panels. Light from the Sun is being collected by the solar panels, part of one being visible on the far right. Actually, at the present time, you have two arms operating on Mars, but they are separated by about 600 kilometers. That’s because your other active arm is connected to the Curiosity rover exploring a distant crater. Taken a week ago, rusty soil and rocks are visible in the featured image beyond Insight, as well as the orange sky of Mars. Posted on Monday, 10 December 2018 by VGC	This entry was posted in ifttt-photograph and tagged IFTTT, NASA. Bookmark the permalink.